I have a friend who travels...a lot. Only pilots and flight attendants log in more time in the air than my friend and her husband. No exaggeration. They have so many frequent flyer miles, she used some of them to get a plane ticket for another friend of mine a few years back...and it didn't even make a dent in her account. The most interesting thing about their travels, however, is not the number of frequent flyer miles they've accumulated, or even the many places they've visited--it's the natural disasters that seem to occur in advance of their arrival wherever they go. 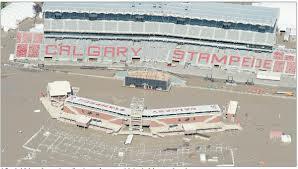 There was the earthquake in Chile...the tsunami in Japan...and now, as they prepare to leave for Canada to see the Calgary Stampede...yep, Calgary's been flooded! When I pointed this out to her, she mentioned some of the places they haven't yet visited--like Yellowstone National Park, the Galapagos Islands and Peru--and said she didn't even want to think about what large-scale disasters might precede them there! Now, I'm not saying my friend and her husband are the harbingers of doom--in fact, I've come to think of her as my guardian angel--but are all of these disasters really a coincidence? Or are they following the signs of the Apocalypse? Good thing she has a great sense of humor! No she won't Norma, it's very funny :) Now you see this is why I don't fly..unless it's to Sydney or Paris haha! William pointed out that Yellowstone might be a really bad idea. At lest the disaster has happened before they get there and not when they arrive. I would like to have them get to the airport and at the last second change destinations and see what happens. Oh and please don't have them travel to Osaka, LA and Tucson in the next few months son and family are coming for a visit. 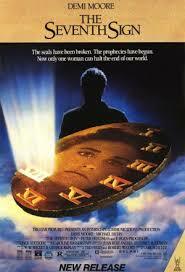 I remember "The Seventh Sign"
Yes, you're as good as dead! Might as well get into witness protection now! Yep! I have nowhere to hide! Maybe they'll miss this post!